The following notes were the basis for my recent keynote to a large cluster of Whanganui schools, with thanks for the opportunity to speak with nearly 300 teachers. 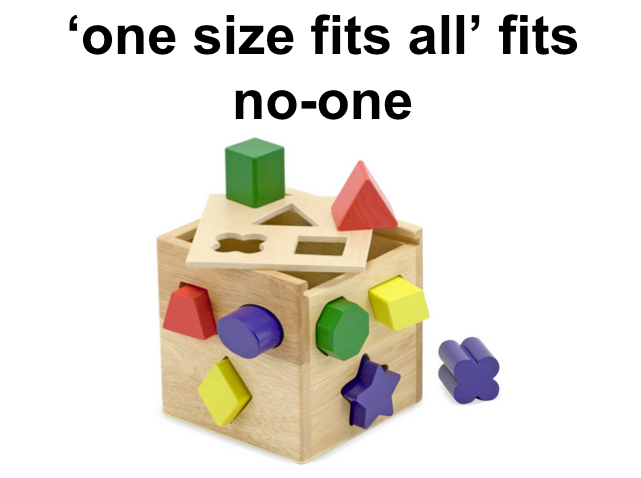 Over the past years we have become aware that ‘one size fits all’ no longer fits anyone, that the ‘industrial models’ of education – legacy thinking – are being rapidly debunked by the changing nature of society, of information, and access to current research around learning and education. And, of course, technology is a key driver – the revolution as we move into an online world has transformed almost every part of our lives. Essentially, though it is a shift from the power of one – authority, editor, teacher – to one in which of all of us have / expect to have / deserve to have a voice and choice that is the ultimate driver of new thinking around education. Keri Facer talks about school as being a place where we learn to ‘do democracy’ – not necessarily become democratic or exercise democratic rights – but a place where we learn about how much power we have, what it means to be a citizen, how much our voice counts. Am I in a room where the teacher decides how I spend each minute of the lesson? Am I learning about ideas that have real meaning in society? Can I see ways to make a difference today? In a similar vein, danah boyd tells us that online networks are the new publics – the town squares, where young people learn about society, relationships – it’s where we have to learn to manage ourselves, connect with others, take responsibility. When a school decides to allow me to have a digital device, have I been given a doorway into the world of information that I can open and use as part of learning – and am I allowed to use it for meaningful exploration and application – a community project, a design for a new way to help the environment? Or do I have to switch it – and therefore my voice – off and ignore the pathway to the world outside? How far are schools using technologies to exert power relationships over individuals? The entertaining story of the Never Seconds blog is a perfect illustration of how fostering individual voices can make a real difference for how young people feel about themselves and the way they can have impact around them. For educators, what is most interesting is that this shift towards choice and personal access in an online world aligns with what we know works for powerful learning. We have social media – and we also have socio-constructive paradigms. We have personalisable tech and we are also reaching to wrap learning design around each learner. Anyone can publish, share, create and collaborate with anyone else – and we are increasingly advocating student agency over learning. Digital technologies are very much in the minds of many of us today – and there is plenty to learn and be excited by. But there is no app for one’s moral compass. Effective use of technologies can only accelerate whatever approach to learning we design. So let it accelerate learning that enables students by giving them control and agency over their learning. What might this mean for us? Design for choice and voice. Think of your young people as citizens now, not citizens in waiting – what might they accomplish given meaningful contexts to grapple with, contexts that are meaningful for them and clarity over goals and next steps. Design from the edges and start with an inclusive direction. Take a risk and let that risk be learning-focused, not just tech-focused – look at your students, get to know them and plan to use whatever you explore today to make an innovation in your practice for tomorrow. Hattie reminds us that the greatest shift for learners is in the hands of each of you sitting here today…think about all the real reasons you are teaching and set you to find out ways to design learning that gives each learner genuine voice and choice. Claxton (2008) – What’s the point of school? Voice and Choice: Growing great citizens for a connected world by Karen Melhuish Spencer is licensed under a Creative Commons Attribution-NonCommercial-ShareAlike 3.0 Unported License. When a school decide sot allow me to have a digital device, have I been given a doorway into the world of information that I can open and use as part of learning – and am I allowed to use it for meaningful exploration and application – a community project, a design for a new way to help the environment? Or do I have to switch it – and therefore my voice – off and ignore the pathway to the world outside? How far are schools using technologies to exert power relationships over individuals? The entertaining story of the Never Seconds blog is a perfect illustration of how fostering individual voices can make a real difference for how young people feel about themselves and the way they can have impact around them. Thanks for your comments, Tony. I am really interested in the messages we send about learning and our students’ roles in that process that we send when we invite technology into schools. Glad it struck a chord:) Good luck with the paper! I love this post. But then I would say that since it resonates so much with our project of Student Choice – I thought I’d pass on that in the 18 months since its implementation, our school’s rating by the inspectorate has gone up significantly and our students’ results in the national standardised tests have also improved by over 20%. Not a bad achievement given that neither of those measures were what we were concentrating on. I think we’re onto something important here – hope all is well! Thanks, Darylle – good luck with the blog! Love the thinking here, so thanks! Am exploring teacher and student agency through a drama pedagogy ( enhanced forum theatre) so this has resonance for me. NextHave you joined the tech revolution?